Language is tricky. It’s full of nuance and layers, and regional and dialectal variations that complicate things even further. For example, if I was to describe something as “sick”, do I mean that it’s disgusting, impressive, or quite literally unwell? Again, there’s the word “cool”. Is it a positive adjective, or a statement of temperature? Computers really struggle to understand this. Sure, you can train an AI to identify spelling mistakes and grammatical errors. It’s relatively trivial to build a bot whose job is solely to identify the use of passive voice. But when it comes to actually understanding the language used, and making suggestions based on it, they tend to fall down. Toronto-based startup Atomic Reach thinks that it’s got the answer to this problem with its Atomic AI platform, which launches today. Here’s how it works. At the core, you’ve got an artificial neural network that’s been painstakingly built to understand 23 distinct measures of language and structure. This artificial neural network is continuously growing, and as it consumes more data, it becomes more precise. It boasts over three million articles in its database. This is growing constantly, and is analyzed on a regular basis. “While a human being has an understanding of communication and language, computers do not,” explained Bradley Silver, co-founder of Atomic Reach. Silver explained that Atomic AI has been developed with the ability to identify the context and intended use of each word. From this, it’s able to suggest relevant synonyms that it feels would improve the readability of the written piece. 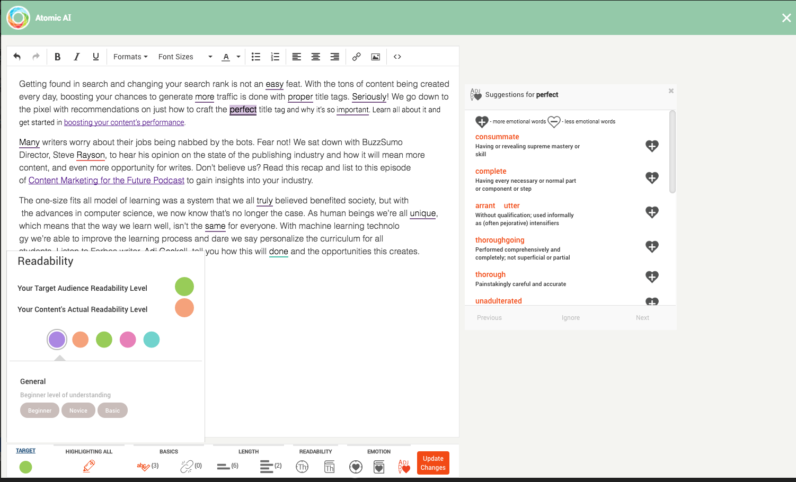 Atomic AI falls into a fiercely competitive market that includes the likes of Grammarly and Yoast. But it also differs in a number of key areas. Firstly, in complexity. Atomic AI is the product of a painstaking, three-year development process that has seen Atomic Reach clinch around $9 million in venture capital. But it’s also aimed at a less general market, as it’s primarily built with content marketers in mind. This influences what it looks for. Atomic AI isn’t solely concerned about readability. It considers the things that marketers care about – like engagement and conversions. “The Atomic AI platform is primarily targeted at large enterprises with multiple people in the marketing department, as well as digital publishers who publish a lot of content,” said Silver. While it officially launches today, it’s been tested in the real world with impressive results, with one healthcare provider growing the reach of their blogs from 200,000 visits to a staggering 3.5 million. Atomic AI is available to test from today, and is available through the browser, and as a Chrome and WordPress extension. But with packages ranging in price from $850 to $4,500 per month, you’ll need pretty deep pockets.